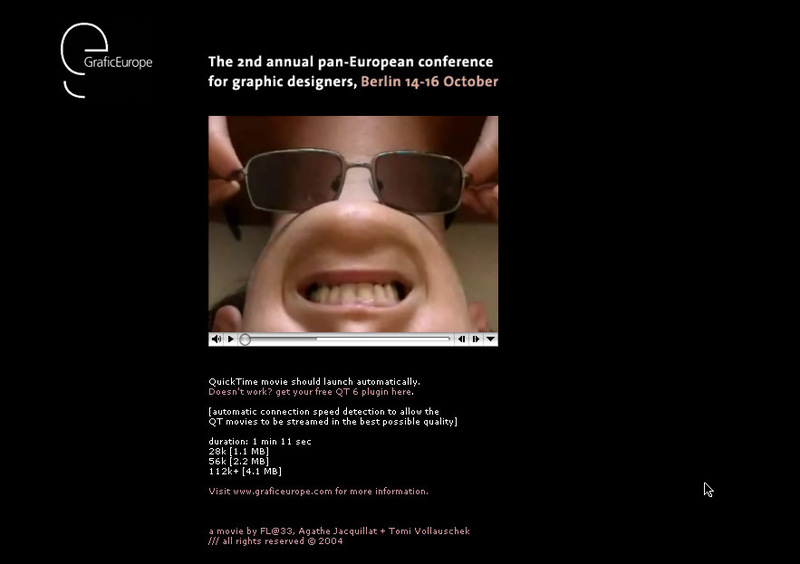 Commissioned by Rotovision / Rockport Publishers for graphic design conference GraficEurope, Berlin, Germany, 14–16 October 2004. ___ FL@33 was asked to develop an idea to promote ticket sales for the GraficEurope conference. The low-budget movie we came up with was sent via email newsletter linking to an online microsite we built where the QuickTime movie was streaming. ___ Distributing video footage online was technically not the easiest of tasks at the time without high-speed internet connections around. ___ Hard to imagine today but autumn 2004 was a time before YouTube (which launched in February 2005) and similar services – now of course available for all of us to use at our fingertips. Shown here are newsletter, microsite, movie stills and two video versions. The small QuickTime movie (with type) is the final edit – it is smaller in dimensions and file size. The higher definition version (without type) is presented using one of today's many obvious choices for presenting video footage online – for example simply posting it via our Vimeo channel. ___ Please note that the conference's website (mentioned in the small QuickTime movie) is not existing anymore.